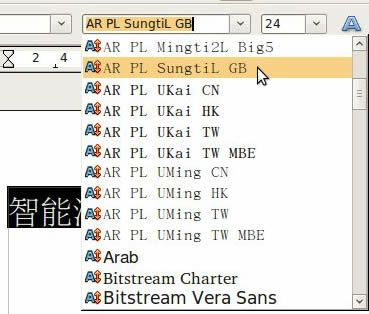 Font names ending in "GB" and "CN" are simplified Chinese, while font names ending in "Big 5", "TW" and "HK" are traditional. I assume the HK font includes the Hong Kong Character Set (HKCS). 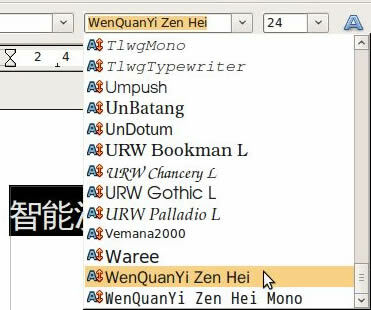 For that font most will still need a Cantonese input method, which does not come in the standard Ubuntu download. You can download and install Cantonese via Synaptic (search for ibus-table-cantonese, ibus-table-jyutping, or scim-tables-zh) or you can use CantoInput which is a free Java app I have reviewed in my survey of third-party apps. The font name ending with "Mono" is a "monospaced" font. This has nothing to do with the Chinese characters in the font. Some non-Chinese character sets in this font like Latin (i.e. English, etc.) have the same spacing between each letter, as you might see produced by an old typewriter. The other version of the same font offers proportional spacing between the letters. But if you switch to Engilsh or another language using Latin characters I recommend you use a Latin font anyway. If you need more fonts, see my survey of free and commercial third-party Chinese fonts on this site. Chinese translation (Tools > Language > Chinese translation) converts between simplified and traditional characters and vice-versa. It of course works better from traditional to simplified than in the opposite direction due to the larger number of possibilities. Phonetic Guide (Format > Asian phonetic guide) will let you place Zhuyin or Pinyin pronunciation "ruby" text above or alongside your Chinese characters. You can select text in your document and it will appear in the Phonetic Guide, but OpenOffice requires you to type in those rubies by hand. To automatically generate Pinyin ruby text you may want to try a new open-source extension for OOo - in alpha last time I checked - called oopinyinguide , or you can use one of the many free online annotation tools, like the one offered by Mandarin Spot . In either case, you'll have to watch out for "poyin" characters with more than one pronunciation. Microsoft Word's more mature (but IMHO still unfinished) Phonetic Guide automatically looks up the Pinyin or Zhuyin for you, or at least it's supposed to...if you have Word and that feature is not working, see my FAQ on MS Word's Phonetic Guide not displaying ruby text. Asian typography — type those two words into the Help search index for information on setting rules for Asian text line breaks, sentence beginning/ending characters, hanging punctuation and automatically inserting a special space between characters. Vertical text boxes — type that in the Help search index and then scroll down for information on vertical callouts (whatever they are) and vertical text boxes for Asian characters.